Jesus, a flesh-and-blood creature, was a historical figure anchored in time and in space, who was the living, breathing demonstration of man as God designed him to be -- a creature of the earth who walked the soils of Palestine when Augustus and Tiberius ruled Rome, and who, as an obedient Son of the Father, found all of God's stars within the reach of his hand. A Stunning Paradox - The community of faith has persistently affirmed the Christ to be both human and divine. Hence, the incredible wonder of God's presence among us, in the person of Jesus of Nazareth, turns to a stunning paradox in the face of the New Testament claim that irrespective of his divinity, "the annointed one of God" lived and walked among his contemporaries as a historical personage who was totally human. In his dual manifestation of both divine and human, he revealed to us not only the nature of God but the true nature of man as well. How, and in what manner, is his humanity affirmed by the writers of the New Testament? Let us look to the biblical record for an answer. Born in Our Likeness - Born of a woman, he was a creature of the earth. When his contemporaries looked at him, they did not see an otherworldly figure but one of their own kind. Jesus looked like a man. He experienced temptations, sorrow, exhaustion and fatigue, distress in heart and spirit, thirst, hunger, loneliness, rejection, pain and suffering. He wept, showed a need for friendship and fellowship with others around him, and confessed a limited knowledge. He was not pretending to be a man. He was a man, born in our likeness. But there is more to the story. Christ's humanity was a "fulfilled humanity"! A "corrective" if you will, of the human drama that went horribly wrong in the first Adam, Jesus of Nazareth is portrayed by the biblical writers as a historical figure who manifested in his flesh "idealized man" or man as God first designed him to be! Biblical Comparisons - It is no accident that the Scriptures attribute to Jesus every endowment which belonged first to Adam. Both were born in the fullness of God's image. Both were declared to be sinless beings. Both are described as having been tempted, and both were called to live out their lives within the confines of a "limited freedom" that had been orchestrated by God. It was at the latter crossroads that Adam took one path and Jesus another. Jesus took cognizance of a truth which Adam did not! Jesus placed no claim tags on divine prerogatives which belonged solely to God. And he did not seek unrestricted freedom which had so enchanted the "first-born" of creation. The Means and the Manner of Appropriation - Obedience to God dominated Christ's lifestyle. Jesus mirrored in his person a consuming kind of dependence upon his eternal Father, a thankfulness that was constant and a determination to do the will of God that knew no end. And in that role of the perfect obedient, the man from Narareth appropriated the full powers, promises, and potentialities which belonged to him as a person. That it is in the posture of total selflessness, dependence upon and a compelling obedience to the will and purposes of God -- that the flower of a true humanity flourishes and grows. Indeed, Christ's humanity was a "fulfilled humanity"! Adam, the rebel, stands naked beside him clothed only in the manifold frustrations and unrealized dreams of an unfulfilled life brought about by his rebellion. What can a person be under God? Behold the man Jesus and see! Flower-decked staff - As the perfect obedient, Jesus appropriated the full powers, promises, and potentialities which belong to him as man. 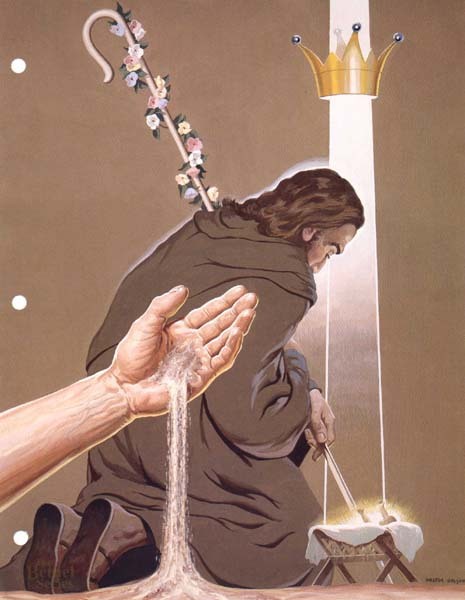 Shaft of light - In the role of man "as designed to be," Jesus manifested a "fulfilled humanity."